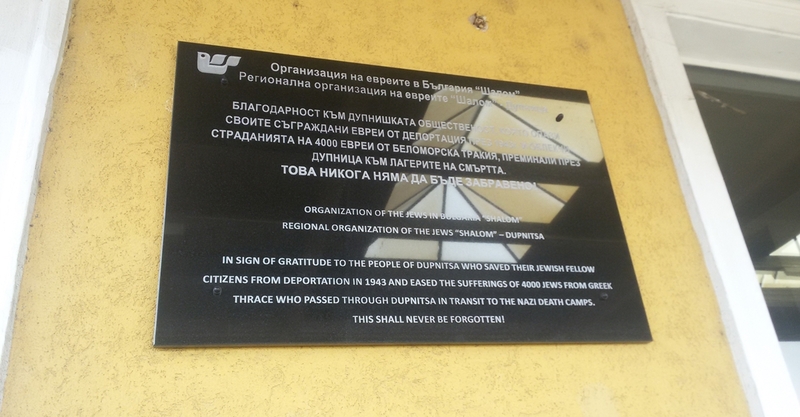 A commemorative plaque has been unveiled at Dupnitsa railway station in Bulgaria, paying tribute to the people of the town for their role in the rescue of Bulgarian Jews from the Holocaust and in giving whatever help they could to Jews from neighbouring territories who were on trains bound for the death camps. 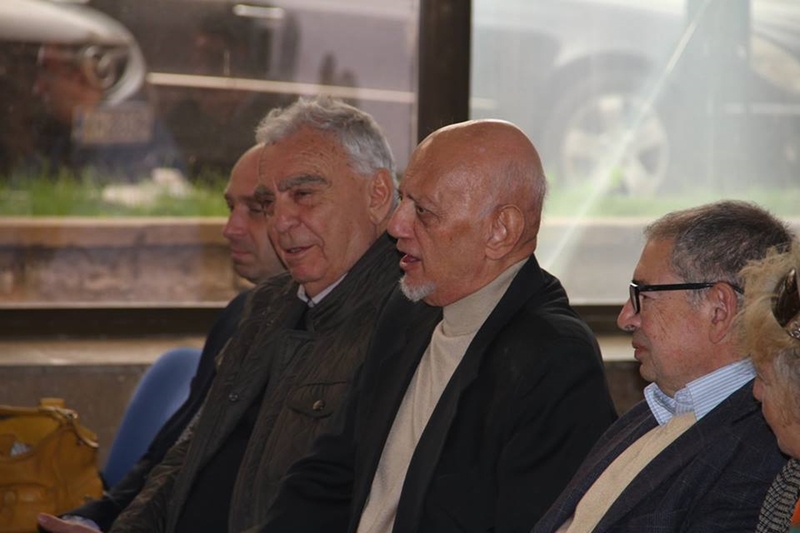 Those attending the April 17 unveiling included Dupnitsa mayor Metodi Chimev, Deputy Foreign Minister and National Co-ordinator for Combating Anti-Semitism Georg Georgiev, Dr Alexander Oscar, President of “Shalom” and Leonid Hazdai, head of the Dupnitsa regional organisation of “Shalom”. The Bulgarian Orthodox Church was represented by the deputy head of the Dupnitsa parish, Father Georgi Palikarski. Also in attendance were MPs from the area, and municipal councillors. Opening the ceremony, Hazdai spoke of how the people of Dupnitsa, defying the authorities, brought water, food and clothing for the children to the Jews in the trains at the station. This, along with the courage of the Bulgarians who rescued Bulgarian Jews also from going to the Holocaust, would never be forgotten, he said. Hazdai said that, ordinarily, memorials are put up where something happened. “However, we chose to put the memorial right here because something did not happen – right here, at this railway station, there were trains made up of horse carriages, in which 1600 Jews from the Dupnitsa region were to be taken to the altar of human insanity. Fortunately, those trains never left”. The rescue of the Bulgarian Jews was a struggle against fate, a struggle that was carried on every day and that gave no quarter, he said. It should be remembered not only at anniversaries and commemorations, but daily, Hazdai said. 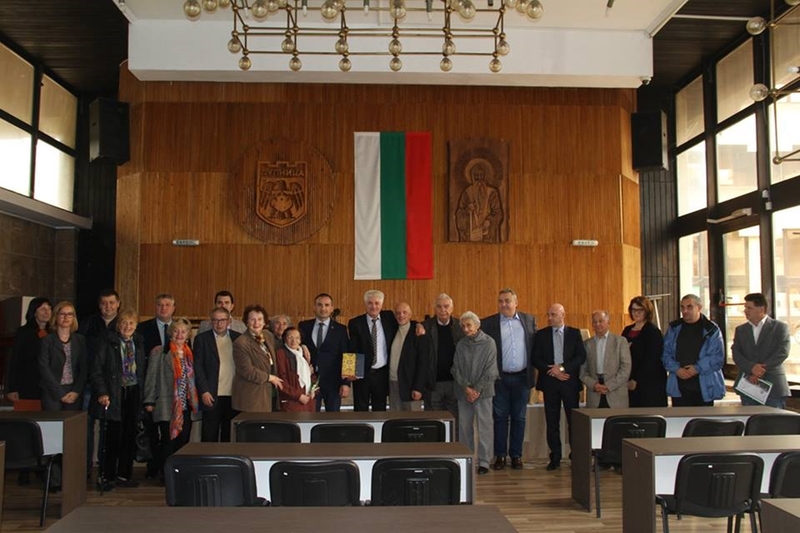 Mayor Chimev pointed to the actions of Dimitar Ikonomov, in 1943 an MP from Dupnitsa, who was among those who made clear his opposition to the plan to deport Bulgarian Jews. In 1943, when the plan to deport Bulgarian Jews to the Nazi death camps was leaked, MPs led by the then Deputy Speaker of the National Assembly, Dimitar Peshev, petitioned and appealed to the government to halt the plan. Along with the outspoken opposition by the Bulgarian Orthodox Church to the plan, and the firm resistance by intellectuals and ordinary Bulgarians, the plan was suspended and ultimately never carried out. In 2018, Bulgaria marks the 75th anniversary of these events, along with commemorating the memory of the 11 343 Jews from the “new lands” in Yugoslavia and northern Greece, then under Bulgarian administration, who were deported to be murdered at Treblinka. Ikonomov was one of the 43 MPs who on March 17 1943 signed a petition to the Prime Minister of the time – Bogdan Filov, a notorious anti-Semite – declaring themselves opposed to the deportation plan. Under severe pressure, Ikonomov subsequently withdrew his signature, but he and his wife helped many Jews in Dupnitsa who were slated for deportation. Georgiev said that 75 years ago, Bulgaria had, with the rescue of the Bulgarian Jews, created a moment in Bulgarian and world history that the country could remember with pride, while bowing its head in memory of those Jews who had been deported to die in the Holocaust. Dr Oscar said that people like Ikonomov had helped write a bright chapter of history, the rescue of the Bulgarian Jews, and today’s Bulgarian Jews would never forget this, just as those who were deported would never be forgotten. The ceremony closed with a moving reading by Viktoria Atanasova of an extract from a poem by Dupnitsa poet Simcho Izakov, entitled “Trains”, written immediately after the deportation of the Jews from the “new lands” via Dupnitsa. After the ceremony at the railway station, mayor Chimev hosted the “Shalom” delegation at the municipality, where members who had been rescued from deportation spoke movingly of their experiences of the time, of the tolerance, the assistance from other Bulgarians, and of a Bulgaria where those who joined anti-Semitic organisations were no more than a small minority. Among those who shared their recollections were Mincho Shekerdjiyski and Aroncho Aronov. 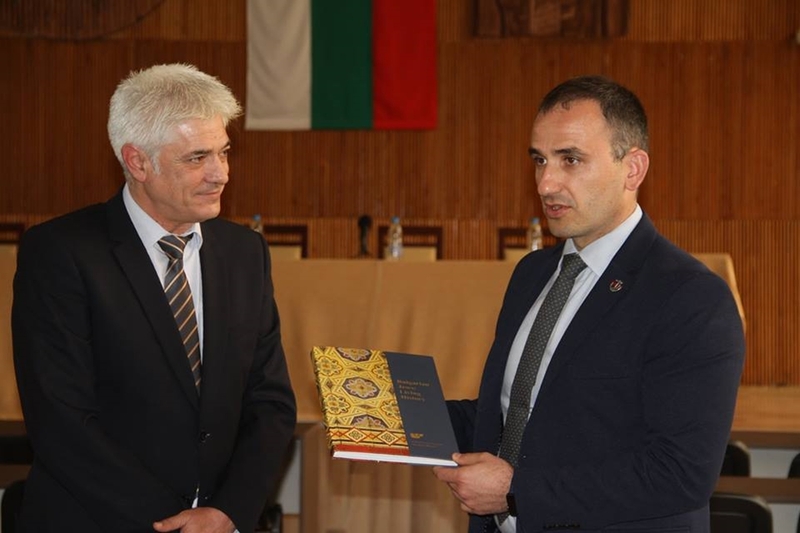 ‘Shalom’ President Dr Alexander Oscar presented Dupnitsa mayor Metodi Chimev with a copy of Shalom’s book, ‘Bulgarian Jews: Living History‘.